Our coops and pens: Secure areas for hens, poults, seniors and injured birds, internal doors between pens as well as areas to keep food dry. 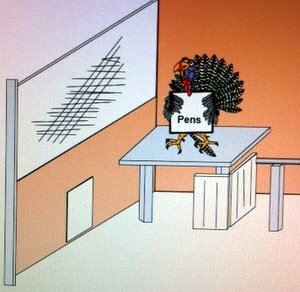 Any large pen will work as a turkey coop. But has anyone ever considered what the turkeys wanted? As with any turkey or chicken coop, the primary function is safety however we added features that blended security, shelter, a baby nursery, and interconnecting doors that can be sealed into three separate pens for multiple hens, an injured bird or if requiring quarantine. 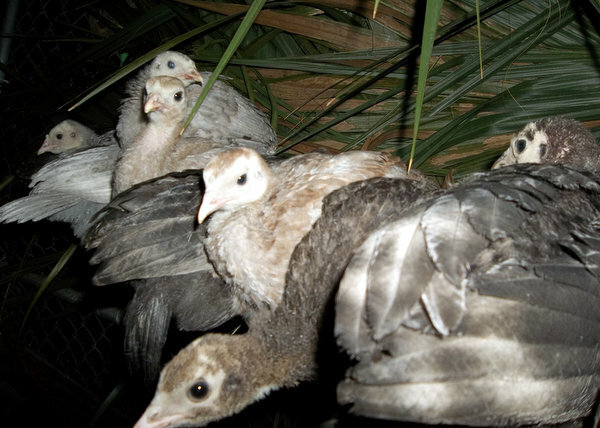 In the above photo, food is placed inside the ground nest box (because of the unpredictable Florida weather) The ground box is only used by the turkey hen during rain storms. 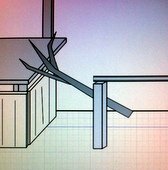 Our turkey coop design – (utilitarian - perhaps a little ugly) was selected and tweaked from years of direct observation of the heritage hen and brood & their inclinations of using the coop during the various stages of growth of the turkey poults. Basically the turkey instinct to be off of the ground is the driving factor of use. Stage One: 1-2 weeks of age: At dusk the hen takes her brood to a corner & settles on the ground covering her chicks with her wings. -We provide clean pine shavings (large flakes only!) or hay for the birds to nest in. 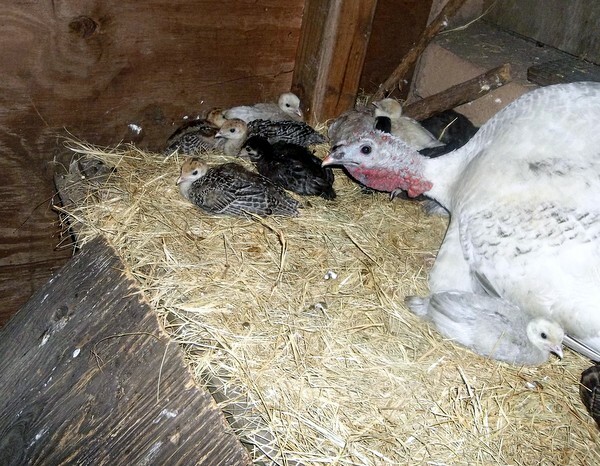 Almost universally, the hen will only take her brood inside the box during inclement weather. Stage Two: 2-4 weeks of age: The hen takes her brood to “top” of nest box, covering the babes with her wings until they can no longer fit under her. Hint: The bottom divider between the pens is plywood (not screen) so the turkeys cannot see other hens. The plywood divider reduces fighting between new mothers. 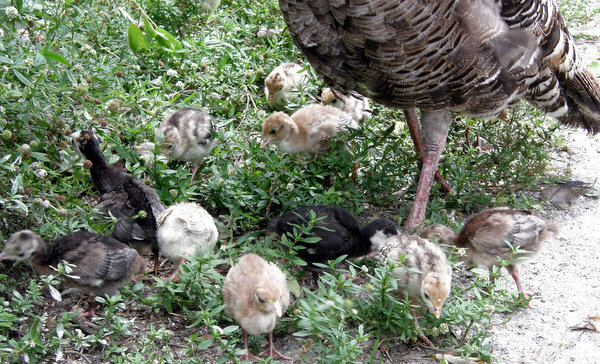 It should be noted that in only a few days -the hens will merge together as a family to raise baby turkeys. And the doors are lifted again. Lifting doors between the pens present the option to create one super pen or the option for three separate “nursery” pens when new eggs hatch out. 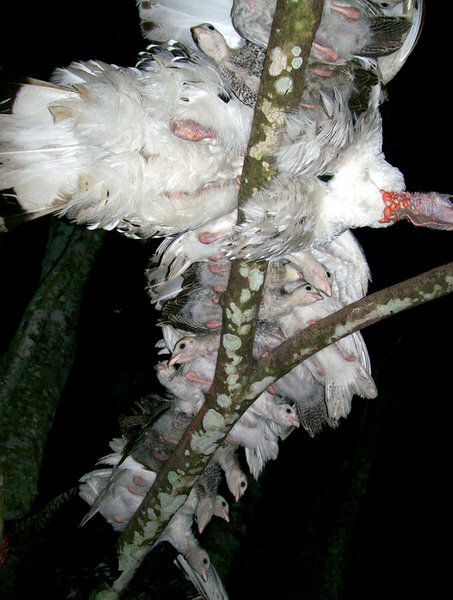 At some point, we let them spend the night outside of the pen in a tree. Normally the mother will begin training flights into the tree just before dusk. Depending upon weather and lack of owls in the area I may allow the birds to spend the night outside. Rain on the way? I guide them inside. Final stage, freedom of the tree! Owl problems? 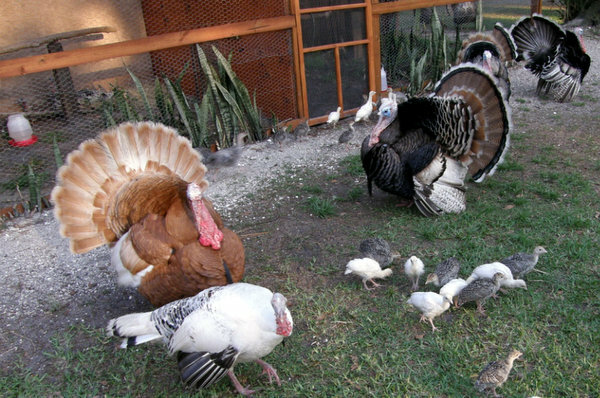 Keep the turkey hen and babies in the secure pens for a longer time. Lift doors between the separate pens could be considered the most important part. Three conjoining pens/coops were constructed using standard sized pre-cut treated lumber. Each pen is 12’ long and 8’ wide. Other details: 6’ tall doors (for us). Chicken wire around the entire pen & 7’ tall (for us). A wire roof was added to ‘keep predators out and keep in hens in’. A perch (branch) approximately 8’ in length and 2’ off the ground. Additional branches are added at higher locations. 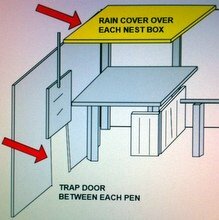 A box that doubles as a rain shelter for food and birds, an elevated nesting platform on the roof of the box. The boxes were constructed for turkeys: 36” x 36” and approximately 30” tall. Walls are put up so the hen can tuck out of sight if she feels she has to hide. The walls of the box are approximately 24” tall, allowing heat to escape in the summer and giving the hens an option to warily scan outside the box. 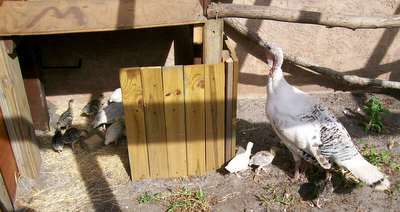 A removable lean-to was added to the front of the nest box, where feed is placed to keep it dry during the often unpredictable Florida weather. Lifting doors between the pens present the option to create one super pen or three separate “nursery” pens. Strips of welded wire metal ½ inch wire cloth was placed along the bottom, on the inside to keep poults from getting their heads trapped in the chicken wire. 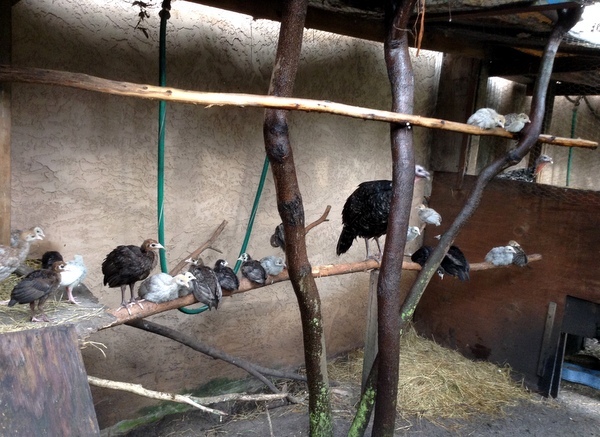 (Yes, it happened every hatching) The wire also deters predators from reaching inside the pen to grab an unwary poult. Additional sections of wire buried at all locations where a predator might attempt to burrow. Sun and rain protection -in central Florida, it sometimes rains every day in the hot summer months. We selected the location of the pens to be adjacent to the maple tree where the mature birds roost and where the brooding hens could see the other bird fly into the tree at sundown and fly out of the tree at dawn. Turkeys have a compulsion to be with the flock and the pen location near the roost was an attempt at mollifying their need. We learned after the fact that we were lucky in our choice of location "It was dry": If the ground is in a wet area, & the poults are forced to walk through/live in mud, they will quickly perish. 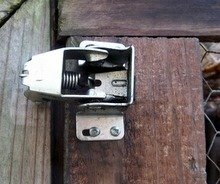 Screen door latch: Also called "Screen door catch"
GET THIS for going in and out of your coop or pen and latch the door securely behind you. A simple push opens the door and automatically latches behind you. Not for a nighttime lock, but this gadget makes you daily visits so much easier! 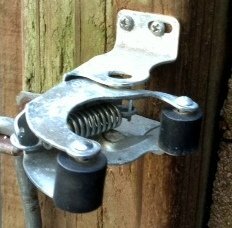 The model we use is "National Hardware V1367 Zinc Plated Screen Door Catches"
Not pushing any brand, -just throwing out the idea to make feeding and watering easier. Recently I moved two hens and brood outside for their first night spent in the outdoor pen. To my exasperation, the hens both settled on top of the box (stage 2) leaving their poults squeaking on the ground (still at the "Stage 1") level. 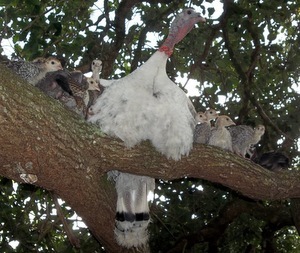 The poults were still too young to grasp the idea they could wing-walk up the branch to the box. So I had to catch each poult and place on top of the box with the two mothers. Sort of comical as I was wing-flogged at least twice by a worried hen. 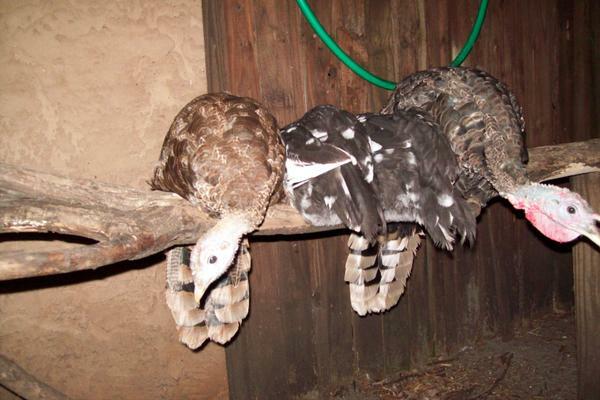 After all baby turkeys were placed on top, the hens and poults settled down to a very relaxing sleep. However I now have five turkey hens that prefer to nest in the chicken coop. That is great for their security and those hens hatch poults more successfully that the "wood line" nesting hens. So I had to construct "turkey size" (super-size) laying boxes for the turkey hens that want to use them. And of course remove the chicken eggs from these boxes.